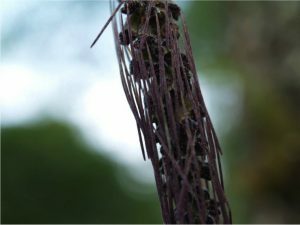 This must be one of our weirdest orchid species. 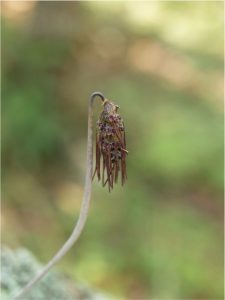 Bulbophyllum is a small growing Bulbophyllum with a remarkable flower spike consisting of many small black flowers which each produce three thin dangly tassels which are attached to the end of each sepal and sway too and fro in the slightest breeze. 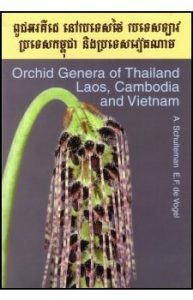 The find was all the more exciting as the species is the cover photo for the book we had been using all trip ‘Orchid Genera of Thailand,Laos, Cambodia and Vietnam. 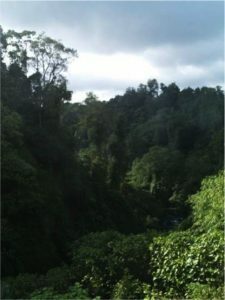 The habitat of the species was humid evergreen forest near a river at about 1000m (see photo below) and so the plant is best suited to growing in our Warm Asia section although it benefits from a cooler dry winter period in the roof of Cool Americas along with a number of our Asian species. If you are going to southern Laos in the near future I can tell you where to look. 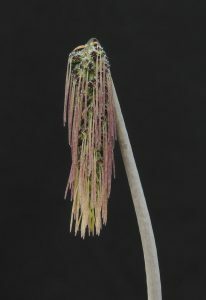 We grow the species high in our Warm Asia section and mounted so that it gets good drainage (the plants in the wild were on bare bark with no moss) and the newest bulb drops its two leaves in December before sending our the thin upright flower spike. Our next challenge is to pollinate it.